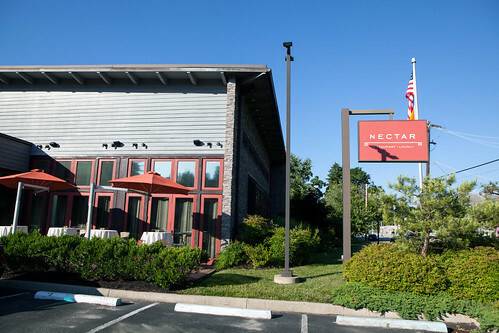 Nectar is about a 30-minute drive from downtown Philly, where we eventually end up in a town that sort of feels like the Hamptons in New York. Dotted with small strip malls along the road and some, like this restaurant, are large freestanding places. 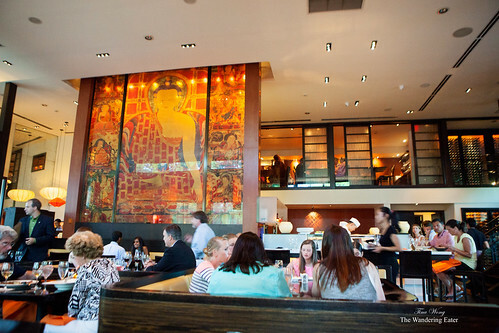 When you enter the heavy doors of Nectar, you would encounter a soaring, dramatic space designed by David Rockwell that is centered by a huge Buddha tapestry and a U-shaped sushi counter that are packed with a mix of affluent locals and a few tables who are here for the splurge dinner. 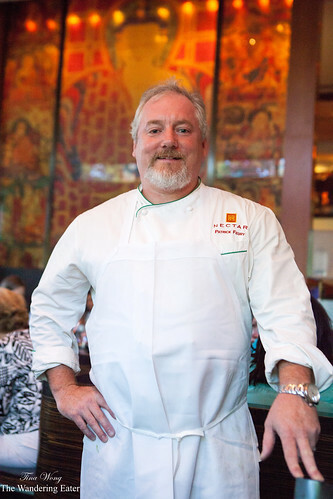 But beneath Nectar’s gloss is creative cooking from Executive Chef Patrick Feury. 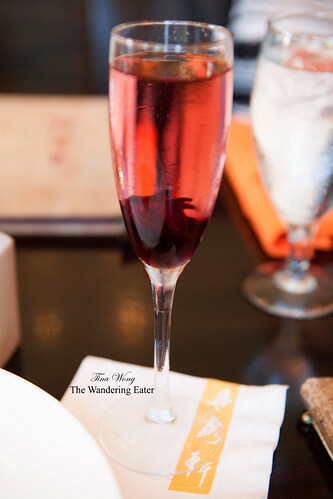 Seasonal drinks and dishes additions spark interest on the menu, which spans straightforward Asian, sushi, New American, and fusions of all three. Despite of the eyebrows this would raise since there’s so much on the menu, Chef Feury and his crew masterfully handles and executes the food this very well. 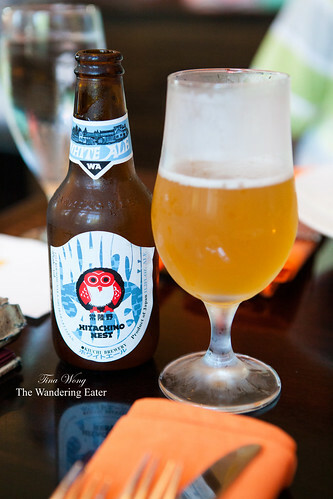 We ordered drinks of a clean, crisp, light bodied Hitachino Nest White Ale ($12) that has notes of wheat-y malts and spicy pepper and citrus. The sweet and fruity Bangkok Mango Martini ($9.95) that is easy to like, and my slightly effervescent, red berry-centered cocktail Hibiscus Bliss ($11.95). 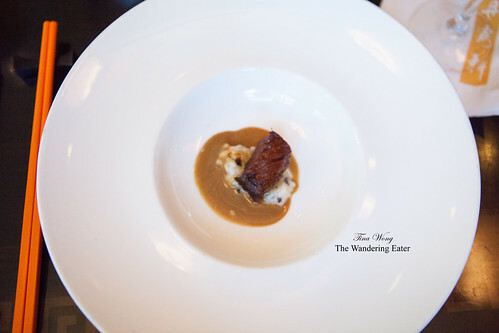 Not too long after our receiving our drinks, Chef Feury greeted us with an amuse bouche of Wagyu beef with black truffle risotto and black truffle emulsion. 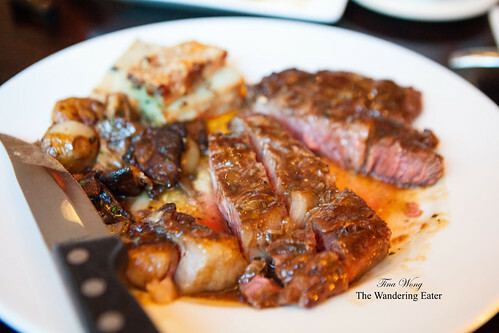 The truffle scent was prominent and the black truffle flavors from the risotto and emulsion did deliver and it does accompany the supple chunk of Wagyu beef wonderfully. 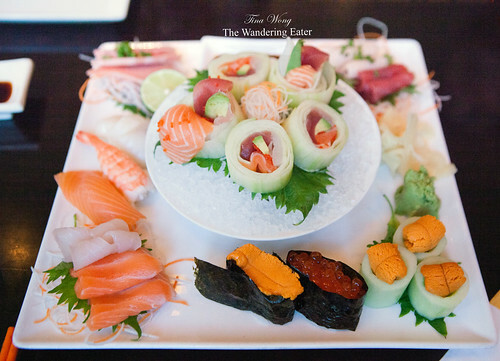 Since we ordered a couple of different of sushi items, we were bestowed with an enormous platter of sushi and sashimi that caught neighboring table’s attention. 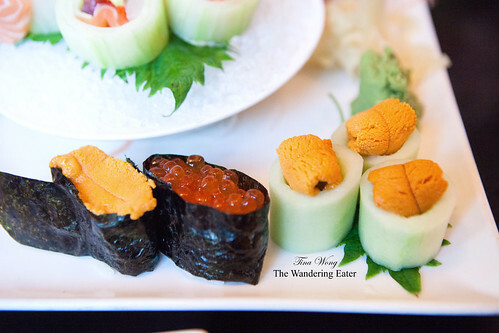 The Sushi Deluxe Entrée ($34) consisted of sea urchin (uni) gunkanmaki, salmon roe gunkanmaki; tuna, salmon, yellowtail, and shrimp nigiris, house tea smoked salmon sashimi, trio of uni ($8 each) set in partially hollowed cucumber, three sashimi slices of bluefin toro ($13 each), and rolls of Chilled no rice sushi roll, tuna, salmon, striped bass, avocado, cucumber ($15). 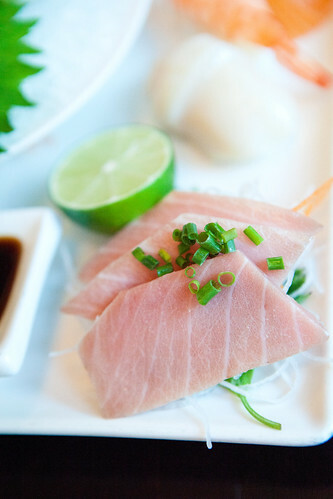 All of these offerings were very fresh and tasted delicious, especially the silky bluefin toro with the yuzu soy sauce. While I do appreciate the idea of a no-rice sushi roll, it’s too clunky and large to eat. It’s hard to keep the fish inside the thick, rolled cucumber strips since there is nothing to keep it together and it’s too large to eat in one bite (it’s more of a two to three bite kind of affair). 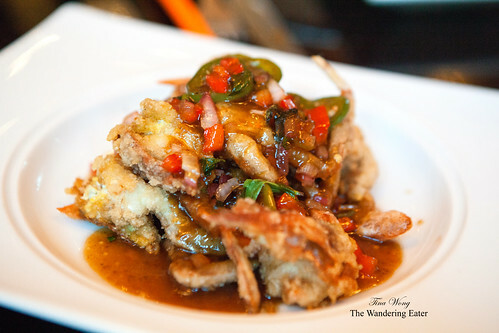 We ordered from their seasonal specials menu and had wok soft shell crabs with lemongrass, tamarind, thai basil, organic chilies ($29, seasonal special) that was superbly fried. Not too greasy, the breading was thin and delicately crisp and we liked the sweet, sour, and slightly spicy flavors of the sauce. 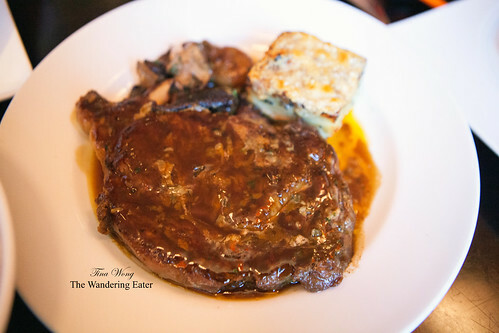 The other seasonal dish we had was the Grilled Pineland Farms Natural ribeye with Birch Run Hills Farm Equinox cheese, winter black truffle, potato gratin, cipollini onions and roasted fresh shiitake mushrooms ($38). The steak was nicely pink for the requested medium-rare temperature and it was super tender. 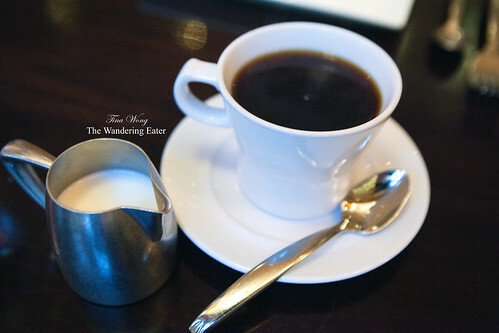 The gravy-like sauce has a touch of black truffle and worked with the minerally steak and the cheese potato gratin and other accompaniments were great together. 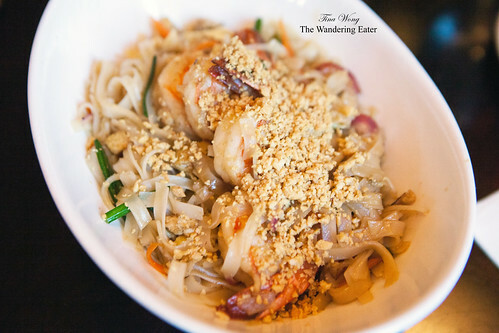 The chef surprised us by sending us a bowl of shrimp Pad Thai ($18), which is a ballsy move considering our table is all Asian and we’re skeptical of having a non-Asian person serving us a Thai noodle dish. 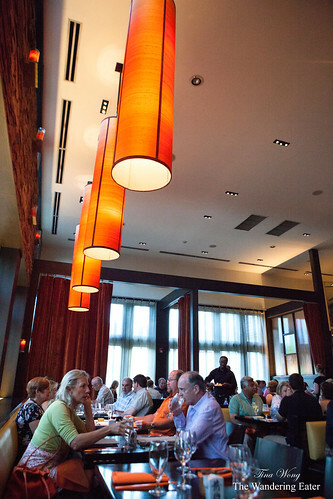 For sure, Chef Feury and his crew proved us wrong by having a well-executed dish. The noodles does have the essence of “breath of the wok,” or wok hay in Cantonese, in that dish along the fact the noodles were not overcooked, dry and flavorful, topped with crushed roasted peanuts. The large shrimp that topped the dish were still subtly crunchy, firm and juicy. 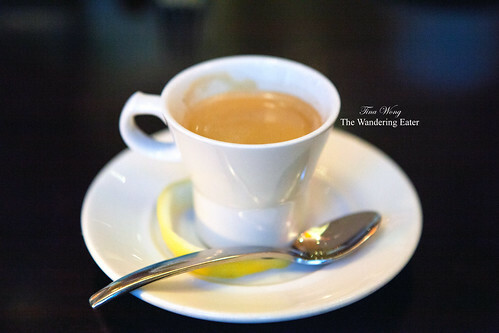 Heading toward dessert, I had a double espresso ($5) since it was a long day of exploring (and eating) and my two companions had cups of coffee ($2.50 each) to go with our desserts. 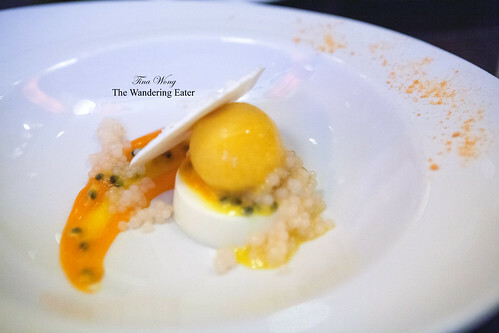 Their coconut panna cotta, passion fruit sorbet, coconut meringue, lychee pearls, passion fruit carrot sauce, carrot powder ($9) was beautifully plated and appropriate for summer. 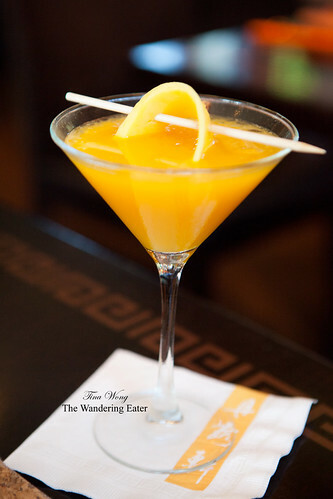 Bright, tart flavors of passion fruit and almost equally potent nutty coconut flavors paired together with the pops of lychee pearls. Not too sweet and my companions wanted to take a larger share of this dessert, despite of how full they felt. 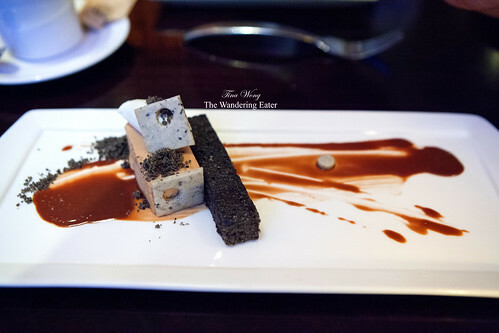 The praline parfait, black sesame financier, sesame shortbread, chocolate sauce, crème fraîche ($9) was delicious as well. The nutty, almost chocolate-y praline parfait paired wonderfully with the nutty, buttery financier and shortbread. If you manage are around Philly and have a car or cab that can take you outside for a bit, this is worth the trek. The food and drinks are great. Service is professional yet friendly. 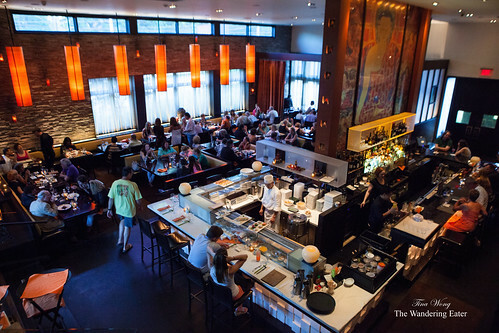 The atmosphere besides of it being glamorous with an Asian bent, it does feel comfortable with plush seating.